The I-5 closure, at the Duwamish River bridge near Southcenter, comes a week ahead of the much hyped three-week blockage of Highway 99 in Central Seattle starting at 10 p.m. Jan. 11. 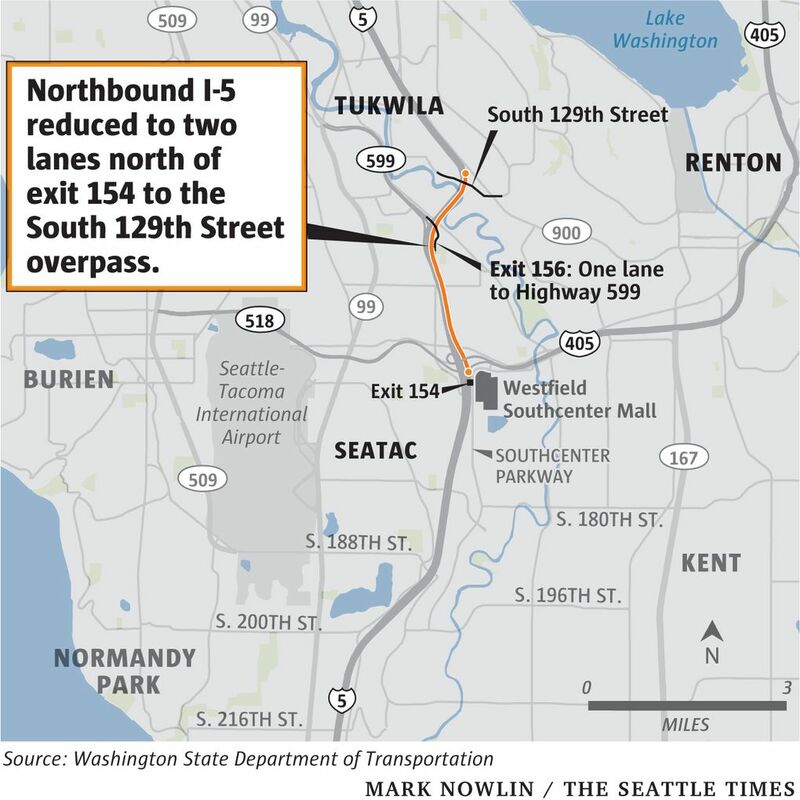 Drivers will get an early taste of the upcoming Seattle Squeeze this weekend, when state crews block three lanes of northbound Interstate 5 at Tukwila for repairs and close two ramps of Highway 99 just south of the Alaskan Way Viaduct. The I-5 closure, at the Duwamish River bridge near Southcenter, comes a week before the much-hyped three-week blockage of Highway 99 in central Seattle starting at 10 p.m. Jan. 11. 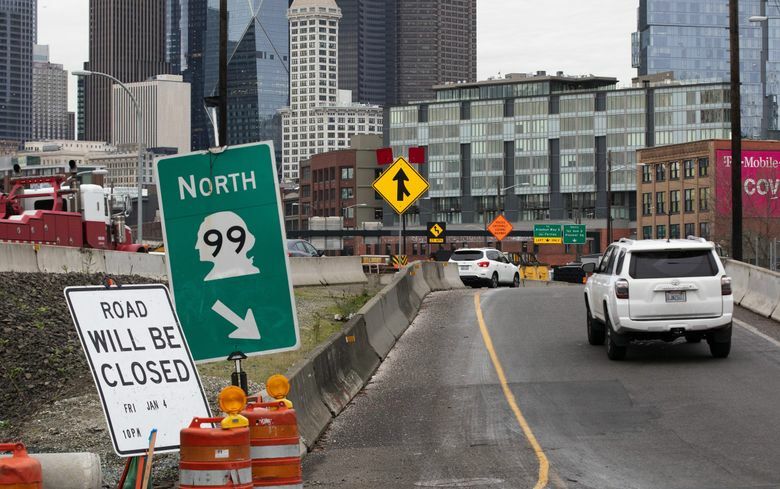 The Alaskan Way Viaduct will permanently close that night and the replacement downtown tunnel won’t be ready for traffic for three weeks, as crews connect ramps between the tunnel and Highway 99. The Washington State Department of Transportation (WSDOT) is aiming to open the new tunnel Monday, Feb. 4, following a weekend of public celebrations. On I-5 at Tukwila, 50-year-old steel plates on roadway expansion joints could pop loose at any time, so WSDOT wants to get repairs done before the viaduct closes. The goal is to have the highway in the best condition possible by the time the viaduct’s closure pushes more cars to I-5, WSDOT spokesman Tom Pearce said. The job is needed because of WSDOT’s own miscalculation involving steel plates that bend around the deck edges of road spans. A steel plate broke Oct. 23, forcing a two-hour emergency repair. When contractors this spring repaved the Duwamish crossing, the agency left old steel in place to save money, thinking the parts remained in good condition, Pearce said. WSDOT couldn’t get replacement parts made until now, he said. Expansion joints are gaps between spans that allow the roadway to expand or contract as temperatures change. This weekend, the three right lanes of northbound I-5 will be closed from 10 p.m. Friday until midnight Sunday. The northbound entrances from Interurban Avenue, Southcenter Boulevard and the I-405 high-occupancy lanes will also close, but drivers can still merge from the I-405 mainline. In addition, the exit will stay open from I-5 to Highway 599, which leads to the south Seattle industrial area and eventually Highway 99 at Sodo. A future closure will be needed to rebuild the left-side expansion joints, Pearce said, but not until after the new downtown tunnel opens. Meanwhile, two stadium-area ramps next to the viaduct will close at 10 p.m. Friday so crews can gain a head-start on realigning Highway 99 from the viaduct into the tunnel. The northbound onramp from Royal Brougham Way South onto the viaduct, and the southbound offramp to South Atlantic Street will close a week before the entire viaduct does. Crews will install Geofoam and fill for abutments, clear off a road deck that WSDOT built and buried in 2011, and perform final concrete paving. The two ramps carry 23,000 vehicles on average each weekday. The ramp closure this weekend might speed up by a week or so the opening of the new quake-resistant stadium interchange, according to a WSDOT road-navigation video guide. The interchange had been expected to open about two weeks after the tunnel is ready for traffic. The three-week Highway 99 closure is expected to be the longest freeway shutdown ever in Washington state, detouring some 90,000 motorists and nearly 30,000 daily bus riders, who in turn will add to regional congestion.